» Careers Careers – One Step Beyond, Inc.
One Step Beyond, Inc. is a 501(c)3 nonprofit organization and a Department of Economic Security, Division of Developmental Disability (DES/DDD) Licensed, Contracted Provider Agency. Our Vision is a world in which individuals with disability are fully included in all aspects of community life and are appreciated for the contributions they can make to their community. Our Mission is to provide programs and services that empower individuals with disability to realize the opportunities that lead to achieving the fundamental components of a fulfilling life: maximum independence, meaningful work, enriching social relationships, and full inclusion in community life. 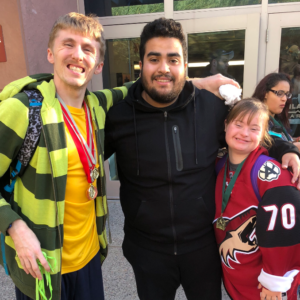 We offer programs in vocational development, employment, and placement; life skills training, focusing on social skill development, functional literacy, and household management; recreation and fitness, including Special Olympics; and cultural arts opportunities.